Purpose: Enhanced S-cone syndrome (ESCS), a rare disorder, is often misdiagnosed as other forms of retinal degenerations, which have a poorer prognosis than ESCS. The aim of this study is to report the varied clinical features of ESCS and distinguish it from other similar disorders. Methods: We retrospectively scrutinized the records of patients with confirmed diagnosis of ESCS and analyzed the findings. Results: We included 14 patients (age range 4–39 years) who were confirmed to have ESCS according to pathognomonic electroretinography (ERG) showing reduced photopic, combined responses, and 30 Hz flicker with reduced L, M cone responses and supernormal S cone responses. The disease presented in the 1st decade with night blindness and was almost stationary or minimally progressive. Mid-peripheral fundus changes in form of nummular pigmentary alterations, yellow punctate lesions, and macular schisis were noted. The vision ranged from 6/6 to 6/36 with follow-up ranging from 1month to 22 years. Conclusion: ESCS shows varied clinical features ranging from unremarkable fundus to pigment clumping and atrophic lesions. It has good prognosis with patients mostly maintaining their vision. ERG is diagnostic. More awareness and knowledge about this entity can help to differentiate it from other forms of night blindness. First described in 1990, the enhanced S-cone syndrome (ESCS) is a rare, autosomal recessive disorder demonstrating characteristic hypersensitivity of the short-wavelength-sensitive cone photoreceptors. The human retina consists of approximately 6 million cones divided into three sub-types: the long-wavelength sensitive (L) cones, the medium-wavelength sensitive (M) cones, and the short-wavelength sensitive (S) cones. In a normal individual, the S-cones constitute approximately 10% of the total cone population. In ESCS, the S-cones constitute majority of the cone subtype. Patients of ESCS typically present with nyctalopia, usually in the first decade, which may or may not be associated with diminished vision., The fundus findings are highly variable and different forms of phenotypic expression have been described. These include the typical nummular pigment deposits at the level of retinal pigment epithelium (RPE) and intraretinal cysts, to the recently described intraretinal yellow dots, helicoid subretinal fibrosis, and torpedo lesions. Cystoid maculopathy/macular schisis is often a commonly associated feature. Because of its phenotypic similarity, ESCS is often misdiagnosed as retinitis pigmentosa (RP), juvenile X-linked retinoschisis (XLRS), and congenital stationary night blindness (CSNB). There are no significant data on the clinical profile of ESCS in the Indian population till date. The purpose of this study was to present a series of 14 patients of Indian origin diagnosed with ESCS and report their phenotypic variation along with findings of electrophysiology and ancillary imaging. This retrospective study was conducted in the vitreoretinal department of a tertiary eye care center in South India. Institutional ethics committee approval was obtained and the study adhered to the tenets of the Declaration of Helsinki. Retrospective records were reviewed, and patients with confirmed diagnosis of ESCS according to ERG waveforms were selected. Patients with ambiguous diagnosis and ERG changes not conforming to the diagnostic criteria were excluded from the study. Optical coherence tomography (OCT) was performed either on the Cirrus OCT (Carl Zeiss Meditec Inc., Dublin, CA, USA) or the Spectralis HRA+OCT (Heidelberg Engineering, Heidelberg, Germany) or the swept source OCT (DRI Atlantis, Topcon Medical Systems Inc., Oakland, NJ, USA). The visual fields (30-2 Swedish interactive threshold algorithm (SITA) standard strategy) were plotted using the Humphrey Field Analyzer (Carl Zeiss Meditec Inc., Dublin, CA, USA). ERG was performed using VERIS Ganzfeld visual-evoked response imaging system, Verison 6.4.2 (Electro-Diagnostic Imaging Inc., Redwood City, CA, USA) in all the patients according to the pre-defined International Society for Clinical Electrophysiology of Vision (ISCEV) criteria. A descriptive analysis was used to report the findings. The search retrieved 28 eyes of 14 patients with the diagnosis of ESCS on ERG. The cohort consisted of 7 males and 7 females. The demographic profile, presenting complaints, best corrected visual acuity (BCVA), refractive error, and fundus features at presentation have been summarized in [Table 1]. The age at the time of first presentation ranged from 4 to 39 years, with the mean age being 13.5 ± 11.3 years. The median age was 10 years. The disease was bilateral in all patients. The most common presenting symptom was nyctalopia (n = 10, 83.33%), with or without diminution of vision (n = 7, 50% each) and floaters (n = 1, 7.14%). The BCVA for distance ranged from 6/6 to 6/36 on the distant Snellen's chart and the near acuity from N6 to N12. Fourteen (50%) of eyes had a hyperopic spherical refractive error ranging from 1 to 7.5 dioptres with varying degrees of astigmatism. 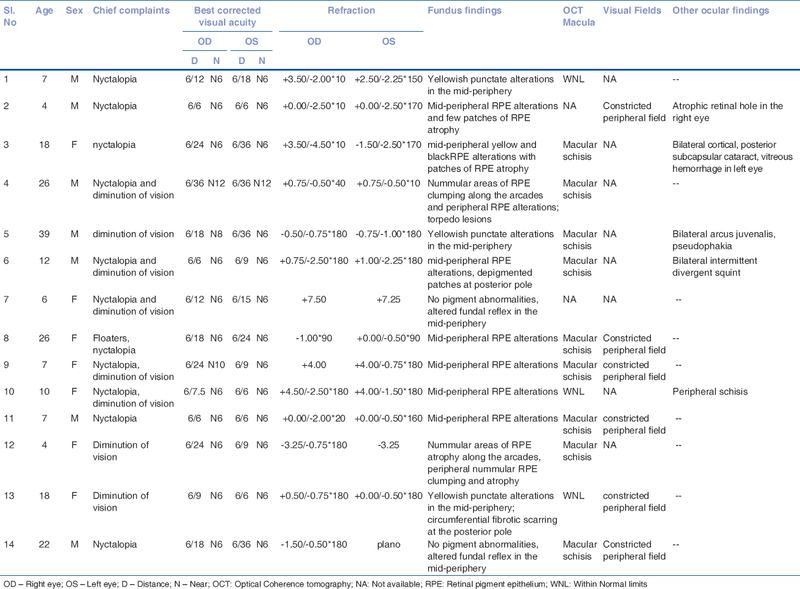 The most common clinical finding was that of pigmentary alterations of the RPE in the mid-peripheral fundus, observed in 7 patients (50%) [Figure 1]. Nummular patches of the RPE clumping in the mid-peripheral fundus along with varying degrees of RPE atrophy was observed in 2 patients (no. 4 and 6) [Figure 2]. Three patients (no. 1, 5, and 13) had only fine yellow punctate lesions in the mid-peripheral fundus with absence of any RPE clumping or atrophy [Figure 3]. Two patients (no. 7, a 6-year-old female and no. 14, a 22-year-old male) had no specific changes in the fundus except for altered retinal reflex in the midperiphery. Torpedo-like lesions were observed in 1 patient (no. 4) [Figure 4]a and [Figure 4]b. Circumferential fibrotic scarring at the posterior pole was observed in one eye (patient no. 13) [Figure 5]. Macular schisis documented by OCT was present in 9 of 12 patients (75%), and the macula was within normal limits in the remaining 3 patients (25%). OCT was not available in two patients. The schisis had a varied clinical picture, ranging from a few discernible schitic spaces [Figure 2]c and [Figure 2]d to gross thickening and separation of retinal layers [Figure 4]c and [Figure 4]d. Visual fields were available in 7 patients (50%). Constricted peripheral field was the consistent finding in all the patients. Among other ocular features, 1 patient (patient no. 3) had bilateral posterior subcapsular cataracts and vitreous hemorrhage in the left eye [Figure 6]. A fluorescein angiogram (FFA) was performed to look for the cause. 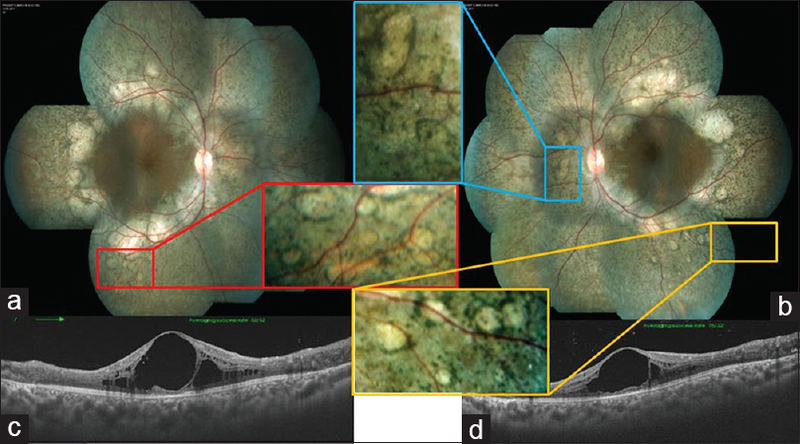 The view of the posterior pole was hazy because of the hemorrhage, but the peripheral fundus beyond arcades in both eyes revealed patchy hyperfluoresence corresponding to the chorioretinal atrophic patches [Figure 6]e, [Figure 6]h but no obvious neovascularization. The hemorrhage spontaneously resolved within 3 months. Peripheral schisis, bilateral arcus juvenilis, and intermittent divergent squint were observed in 1 patient each (7.1%). A prototype full-field ERG in ESCS is shown in [Figure 7]. The ERG consistently demonstrated non-recordable single flash rod responses in all patients. Photopic and scotopic combined responses were also delayed and had a reduced amplitude in 85.71% (n = 12) patients. The 30 Hz flicker was reduced in all patients. The dark-adapted (DA) 3.0 response had a simplified, delayed, and reduced response that was almost similar to the light-adapted (LA) 3.0 response. Cone-specific chromatic stimulation was performed in all patients. Supernormal S-cone responses were observed in all patients. L and M cone responses were delayed and had reduced amplitude in 78.5% (n = 11) patients and were nearly non-recordable in 21.4% (n = 3) patients. Genetic testing for the causative mutation was available in 2 patients. One patient tested positive for mutation in the NR2E3 gene (patient no. 6) on chromosome 15. This patient had subtle yellow pigment deposits in the mid-periphery and macular schisis [Figure 3]. In the other patient, mutation in the neural retina leucine zipper (NRL) gene was detected. This patient had nummular clumping of RPE in the mid-periphery with pigmentary alterations in the periphery and a few schitic spaces on OCT [Figure 4]. The locus in both the genes was on the second exon. 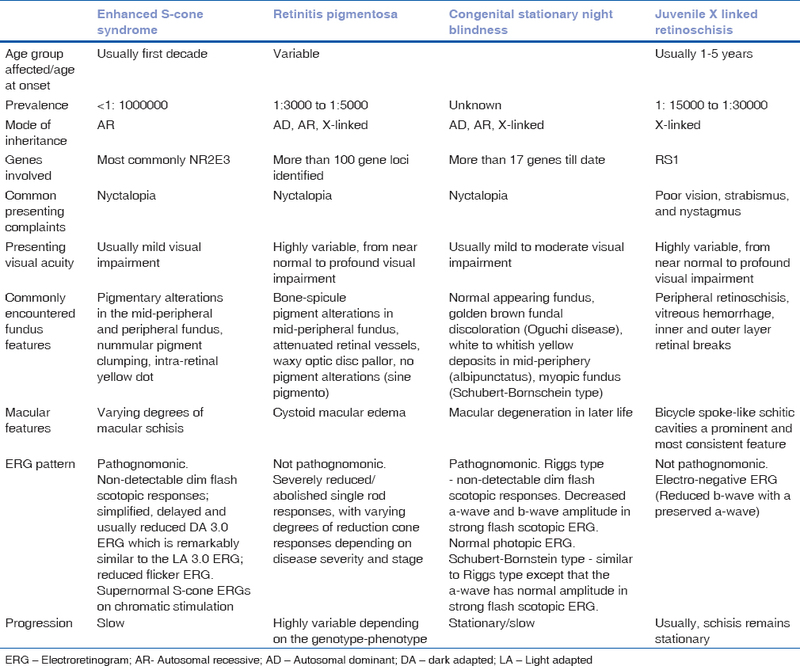 The details of genetic analysis of these patients are provided in [Table 2]. Long follow-up was available for 10 patients (71.42%). The mean follow-up was 74.5 ± 111.1 months, and a median follow-up was of 13 months. In these 10 patients, the visual acuity remained fairly stable till the last available follow-up with no gross deterioration. The classic clinical findings described in ESCS reported previously are the nummular pigment clumping with areas of atrophy in the mid-periphery and periphery, but it has been reported that they are neither a consistent finding nor specific to ESCS. 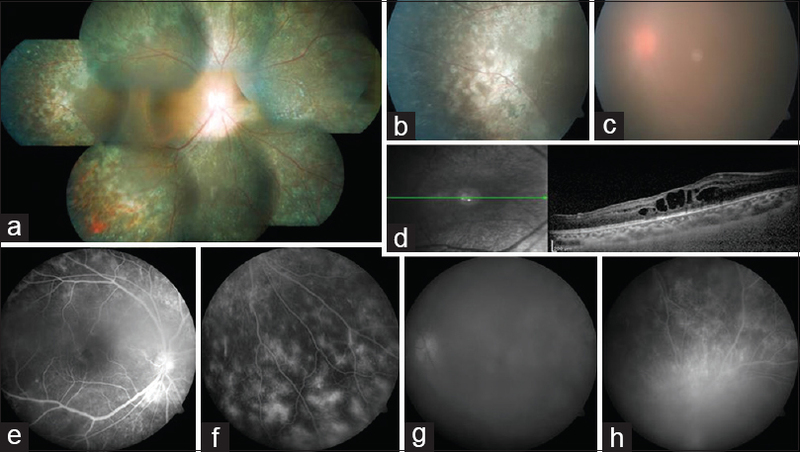 In our series, nummular clumping was observed in only 2 patients, the most common finding being yellow to black irregular pigment alterations in the mid-peripheral fundus. Yzer et al. reported novel clinical findings such as torpedo-like deep atrophic lesions, circumferential fibrotic scars at the posterior pole, around optic nerve head, and yellow dots in the normal-appearing retina. In our study, we found bilateral torpedo-like lesions in 1 patient. The torpedo-like lesions have typically been reported to consist of central depigmentation or chorioretinal atrophy with a hyperpigmented border, and they are observed along the arcades. Both the appearance and location of the torpedo-like lesions in this patient corroborated with the previously reported findings. The age range of patients presenting with these torpedo-like lesions was 24 to 55 years, as reported by Yzer et al. In our cohort, the solitary patient with torpedo-like lesions was 26 years of age. 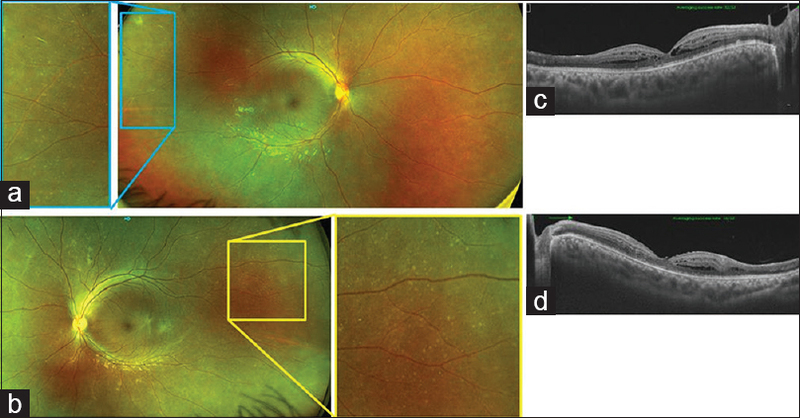 Although the exact pathogenesis of the lesions is not known, abnormal choroidal or ciliary vasculature development or a fetal RPE defect has been postulated., Intraretinal yellow dots have been reported in ESCS and other retinal dystrophies. Yzer et al. peculiarly noted that all patients with subretinal fibrosis also had yellow dots. The location of these has been reported to be variable. In our patients, they were almost uniformly distributed in the mid-periphery of fundus. 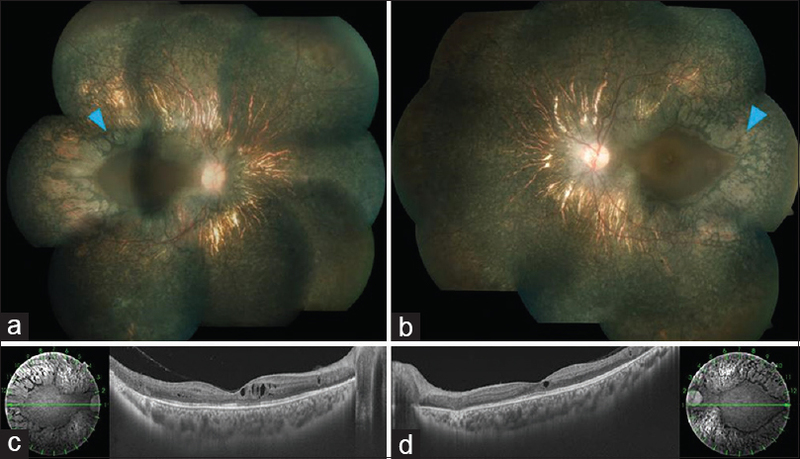 Although helicoid subretinal fibrosis was not observed, 1 patient with intraretinal yellow dots had circumferential subretinal fibrosis at the posterior pole. Although, both peripheral and macular retinoschisis have been reported in ESCS, peripheral retinoschisis is more common.. In our cohort, peripheral retinoschisis was present in only 1 patient (two eyes), whereas macular retinoschisis was more commonly noted, being present in 9 patients (18 eyes). Bilateral disc edema has been reported in a recent study. Despite the variable fundus appearance, the constant finding is that of retinal degeneration in the mid-peripheral area surrounding the central field of vision. This area corresponds with the maximum S-cone dysfunction. This area also coincides with the maximum rod photoreceptor density. Hence, it is postulated that there is failure of the photoreceptors to differentiate properly and are replaced by S cones. This results in visual field loss in the mid-peripheral region. The retinal degeneration is thought to be because of abnormal photoreceptor maintenance, disturbed phagocytosis, microglial proliferation, and complex gene interactions. One limitation of our study was that genotype-phenotype correlation could not be attempted in all patients as only 2 patients had undergone gene testing. NR2E3 mutations were first shown to be associated with ESCS by Haider et al. More than 30 different variations in the NR2E3 mutations causing ESCS, GFS, CPRD, and RP have been identified. Yzer et al. attempted correlation of only those patients with common NR2E3 mutations (p, R311Q and c. 119-2A >C or IVSI-2A >C). However, they could not establish a clear genotype-phenotype relationship as the torpedo-like lesions or the subretinal fibrosis were not exclusive to any genotype. Our solitary patient with NR2E3 mutation had the pathogenic c. 228delG mutation, and the fundus had yellow dots in an otherwise normal appearing retina. The second patient had a mutation in the NRL gene. NRL mutations causing ESCS like manifestations have been reported by other authors.,, Littink et al. reported 3 patients with NRL mutation with ESCS. Phenotypically, all 3 patients had mid-peripheral pronounced RPE atrophy with nummular pigmentations and a preserved macular region. Our patient, too, showed a similar picture [Figure 4]. The pathogenic variation of c.91C >T in the NRL gene was identified in this patient. ESCS is one of the few disorders in which an ERG conclusively establishes the diagnosis. The ERG findings of the present cohort were in unison with the ERG described in literature, viz., abolished or grossly reduced single flash rod responses, simplified waveform of the DA 3.0 response and its similarity to the LA 3.0 response, and a delayed 30 Hz flicker with reduced amplitude. In such scenario, specific chromatic stimulation is not necessary for the diagnosis. However, all the patients in this cohort underwent specific chromatic stimulation and all of them demonstrated supernormal S-cone responses, which is in agreement with findings of Audo et al. They observed that there was a tendency toward progressive decrease in ERG amplitudes with age, so that the older patients had lower amplitudes. However, no such trend was observed in this cohort. Pattern ERG has been reported to be delayed and reduced or even undetectable in ESCS patients. Changes have also been reported in multifocal ERG, which demonstrated relative preservation of central function but reduced responses with increased eccentricity. Electrooculogram in these cases shows an undetectable light rise. However, these investigations were not done in our subjects as they were not essential for diagnosis. Wherever follow-up data were available, none of the patients showed significant reduction in terms of Snellen's visual acuity. However, visual acuity cannot be the sole criterion to detect progression as longitudinal ERG data in some ESCS patients have shown slowly progressive dysfunction with gradual deterioration of visual acuity and variable visual field constriction. As mentioned earlier, ESCS is usually misdiagnosed as RP, CSNB, and XLRS. This is because most of these disorders share common features such as presentation in the early decades of life, night blindness, and mid-peripheral pigmentary changes.,,,,,,,, ESCS being a rare disorder, diagnosis of this entity is a challenge because of relative lack of awareness about this condition and non-availability of electrophysiological testing at all centers. [Table 3] provides a useful guide in differentiation and diagnosis of these disorders. Accurate diagnosis and differentiation are essential because the prognosis of these conditions is different. Although some disorders are rapidly progressive, ESCS is often stationary/slowly progressive. In conclusion, the ESCS is a rare disorder that can have varied phenotypic manifestations that can be confused with other conditions such as RP, CSNB, and XLRS. A pathognomonic ERG is essential to make the accurate diagnosis, which can be substantiated with documented genetic mutation. It is important to recognize this slowly-progressive condition accurately and distinguish it from other phenotypically similar disorders, as the prognosis differs significantly. Marmor MF, Jacobson SG, Foerster MH, Kellner U, Weleber RG. Diagnostic clinical findings of a new syndrome with night blindness, maculopathy, and enhanced S cone sensitivity. Am J Ophthalmol 1990;110:124-34. Curcio CA, Sloan KR, Kalina RE, Hendrickson AE. Human photoreceptor topography. J Comp Neurol 1990;292:446-53. Sohn EH, Chen FK, Rubin GS, Moore AT, Webster AR, MacLaren RE. Macular function assessed by microperimetry in patients with enhanced S-cone syndrome. Ophthalmology 2010;117:1199-206.e1. Audo I, Michaelides M, Robson AG, Hawlina M, Vaclavik V, Sandbach JM, et al. Phenotypic variation in enhanced S-cone syndrome. Invest Ophthalmol Vis Sci 2008;49:2082-93. Jacobson SG, Marmor MF, Kemp CM, Knighton RW. SWS (Blue) cone hypersensitivity in newly identified retinal degeneration. Invest Ophthal Vis Sci 1990;31:827-38. Khan AO, Aldahmesh MA, Al-Harthi E, Alkuraya FA. Helicoid subretinal fibrosis associated with a novel recessive NR2E3 mutation p.S44X. Arch Ophthalmol 2010;128:344-8. Yzer S, Barbazetto I, Allikmets R, van Schooneveld MJ, Bergen A, Tsang SH, et al. Expanded clinical spectrum of enhanced S-cone syndrome. JAMA Ophthalmol 2013;131:1324-30. Vincent A, Robson AG, Holder GE. Pathognomonic (diagnostic) ERGs: A review and update. Retina 2013;33:5-12. Jacobson SG, Roman AJ, Roman MI, Gass JD, Parker JA. Relatively enhanced S cone function in the Goldmann-Favre syndrome. Am J Ophthalmol 1991;111:497-523. Sharon D, Sandberg MA, Caruso RC, Berson EL, Dryja TP. Shared mutations in NR2E3 in enhanced s-cone syndrome, Goldmann-Favre syndrome, and many cases of clumped pigmentary retinal degeneration. Arch Ophthalmol 2003;121:1316-23. McCulloch DL, Marmor MF, Brigell MG, Hamilton R, Holder GE, Tzekov R, et al. ISCEV Standard for full-field clinical electroretinography. Doc Ophthalmol 2015;130:1-12. Shields CL, Guzman JM, Shapiro MJ, Fogel LE, Shields JA. Torpedo maculopathy at the site of the fetal “bulge”. Arch Ophthalmol 2010;128:499-501. Golchet PR, Jampol LM, Mathura JRJr, Daily MJ. Torpedo maculopathy. Br J Ophthalmol 2010;94:302-6. Batioglu F. Goldmann-Favre vitreoretinal degeneration. Eur J Ophthalmol 2003;13:307-10. Özateş S, Tekin K, Teke MY. Goldmann-favresyndrome: Case series. Turkish J Ophthalmol 2018;48:47-51. GarafaloAV, Calzetti G, Cideciyan AV, Roman AJ, Saxena S, Sumaroka A, et al. Conevision changes in the enhancedS-Conesyndrome caused by NR2E3 gene mutations. Invest Ophthalmol Vis Sci 2018;59:3209-19. Haider NB, Jacobson SG, Cideciyan AV, Swiderski R, Streb LM, Searby C, et al. Mutation of a nuclear receptor gene, NR2E3, causes enhanced S cone syndrome, a disorder of retinal cell fate. Nat Genet 2000;24:127-31. Schorderet DF, Escher P. NR2E3 mutations in enhanced S-cone sensitivity syndrome (ESCS), Goldmann-Favre syndrome (GFS), clumped pigmentary retinal degeneration (CPRD), and retinitis pigmentosa (RP). Hum Mutat 2009;30:1475-85. Nishiguchi KM, Friedman JS, Sandberg MA, Swaroop A, Berson EL, Dryja TP. RecessiveNRL mutations in patients with clumped pigmentary retinal degeneration and relative preservation of blue cone function. Proc Natl Acad Sci 2004;101:17819-24. NewmanH, Blumen SC, Braverman I, Hanna R, Tiosano B, Perlman I, et al. Homozygosity for a Recessive loss-of-function mutation of the NRL gene is associated with a variant of enhanced S-Cone syndrome. Invest Ophthalmol Vis Sci 2016;57:5361-71. Littink KW, Stappers PTY, Riemslag FCC, Talsma HE, van Genderen MM, Cremers FPM, et al. Autosomal recessiveNRL mutations in patients with enhanced S-Cone syndrome. Genes 2018;9:68. Weleber RG, Gregory-Evans K. Retinitis pigmentosa and allied disorders. In: Ryan SJ, editor. Retina. 4th ed. Philadelphia, USA: Elsevier; 2006. p. 394-485. Sikkink SK, Biswas S, Parry NRA, Stanga PE, Trump D. X-linked retinoschisis: An update. J Med Genet 2007;44:225-32. Berson EL. Retinitis pigmentosa and allied diseases. In: Albert D, Miller J, Azar D, Blodi B, editors. Albert and Jakobiec, 3rd ed. Philadelphia, PA: Elsevier; 2008. Ch. 177. Baldwin AN, Robson AG, Moore AT, Duncan JL. Ryan'sRetina, In: Schachat AP, editor. Edinburgh, UK: Elsevier; 2018.p. 1006-17. Hirose T, Blodi BA. Retinoschisis. In: Albert DM, editor. Principles and Practice of Ophthalmology. 3rd ed. Philadelphia, USA: Saunders; 2008. p. 2287-304.